(P1) Atlanta’s Hartsfield-Jackson International Airport has nailed down the “World’s Busiest Airport” title for the 18th year in a row. (P2) That was confirmed Friday when the Airports Council International (ACI) trade group finalized its full-year passenger numbers for 2015. The rankings did not change from ACI’s preliminary 2015 numbers released earlier this year, thus making Atlanta’s No. 1 ranking official. (P3) Not only did Atlanta hold on to the top ranking, but it also became the first airport in the world to process 100 million passengers in a calendar year. Atlanta’s 2015 passenger count of 101,491,106 was up 5.5% from 2014. (P4) Also, Atlanta solidified its hold on No. 1 by taking the top spot for “aircraft movements,” another measure of how busy an airport is. “Movements” refers to the number of takeoffs and landings at an airport. Atlanta had briefly lost the title for most movements to Chicago O’Hare in 2014 but surged back past its Illinois rival in 2015. (P5) While each count is legitimate, the passenger tally is the most traditional barometer for determining the busiest airports. 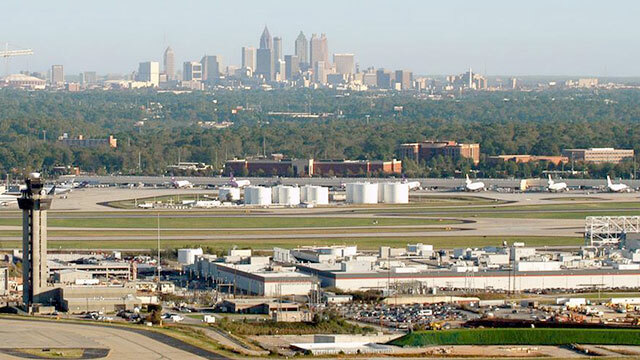 (P6) Atlanta, of course, is the busiest hub for Delta Air Lines, which operates a massive connecting hub there. (P8) Atlanta had long embraced its role as title-holder for the world’s busiest airport, though it’s recently taken a more cautious approach on the subject. The Atlanta Journal-Constitution notes the airport “earlier this year decided to downplay the ‘world’s busiest’ terminology, changing its tagline to the ‘world’s most traveled airport’.” There apparently was concern that “world’s busiest” mantra wasn’t necessarily the best message for fliers concerned about a smooth and relaxing travel experience. (P9) As for Atlanta’s runner-up in the passenger count category, China’s Beijing Capital International Airport held down No. 2 spot for the second year in a row. (P10) Dubai International and Chicago O’Hare made the biggest jumps within the top 10, each rising three spots to Nos. 3 and 4, respectively. Year-over-year passenger traffic grew 10.7% at Dubai and 9.8% at O’Hare. (P11) Each of those airports passed London Heathrow, which fell three spots to No. 6 from No. 3. Passenger traffic rose at Heathrow, but its 2.2% increase was not enough to keep pace with the larger increases seen at Dubai and O’Hare. Also passing Heathrow was Tokyo’s Haneda, though it also fell (from No. 4 to No. 5). (P12) Los Angeles and Dallas/Fort Worth gave the United States two more airports in the top 10, coming in at Nos. 7 and 10, respectively. When you are in an airport, what do you usually do until you board the plane? In your opinion, do you think airports will get even busier in the next 5 years? Why or why not? Do you think the title “most traveled airport” is better than “busiest airport”? Why or why not? How many consecutive years has the Atlanta airport secured the top spot for the busiest airport worldwide? Which other title did the Atlanta airport secure? Which airport came in 2nd place on the busiest airport list? Which three airports beat the London-based airport, Heathrow?